What sort of people are members of the IAA? Members include men and women with academic backgrounds or full time expertise in ballistics, forensics, metallurgy, chemistry, and manufacturing disciplines. Many are current or former military or law enforcement professionals. Members also include historians and hobbyists interested in the evolution of ammunition, and the amazing variety of ingenious designs that have been tried. Some are international experts, and others are just beginning hobbyists who enjoy collecting cartridges. 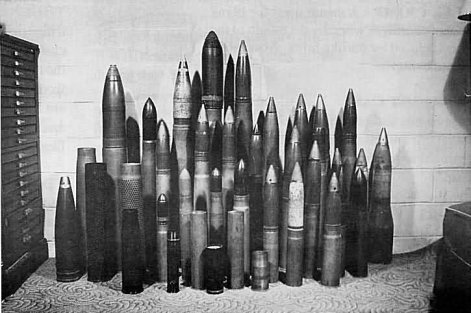 authors of History of Modern U.S. Military Small Arms Ammunition 1880-1945 (two volumes, so far...), the definitive study of the subject, based on solid research and their involvement with the U.S. Army in ammunition design and production. Why do people collect ammunition or cartridges? Members interests range from the very earliest cartridges introduced over 150 years ago to the development of innovative new approaches to meet the emerging needs of military, law enforcement, personal defense, sporting, or target shooting. For some members it is the technical aspects of individual cartridges. For others it is the artistic nature of the packaging. Still others are attracted by the historical lure of famous (or obscure) makers from far flung locations. Some are collectors fulfilling the innate human instinct to gather and collect, just as with those who collect stamps, coins, baseball cards, beanie babies, clocks, fine art, antique automobiles, or must about any other collecting field imaginable. Cartridge collectors may specialize in a specific time period, cartridge ignition type, size of cartridge, maker, type of box, or other aspect that they find appealing. IAA recognizes 75 different specialied ammuniton collecting specialties, listed here.. Some collectors (individuals or organizations) use their collections for reference or research as experts in legal cases, or product development for law enforcement or defense needs. Isn't it dangerous to collect ammunition? If there is a fire, wouldn't it blow up the neighborhood? Virtually every household in America contains many common items which are far more dangerous than even a massive ammunition collection. Cans of spray paint or hair spray, a container of gasoline for a lawn mower, or a propane tank for a BBQ grill or even a small propane torch for home improvement use will all "explode" about as easily as ammunition, and cause more damage by providing fuel to a fire. Obviously military artillery ammunition with live explosive projectiles would be dangerous in a fire, but they are subject to strict controls under federal law. Collectors interested in artillery ammunition are limited to items that have no explosive filling. They can still be dangerous. They are heavy and will hurt if you drop one on your foot. They are exactly as dangerous as a rock you might dig out of your garden. We cannot answer that, even if we see the ammunition. While it may be a desirable collector item, it may be useless for the shooter. Primers can lose (or increase) their sensitivity, propellant charges can deteriorate and fail to burn or burn improperly. Cartridge cases may become brittle and split or rupture when fired. Bullets may become stuck in cases from reaction between different types of metals, or they may change physical dimensions from oxidation or chemical reactions. Age, storage conditions, temperature extremes, and original manufacturing practices may vary greatly and two similar cartridges stored under different conditions may or may not be equally suitable for use. Old ammunition should be saved only as collector items, not for actual use. It is better to spend a few dollars on new ammunition than to risk a misfire or worse which might damage a valuable gun (or the shooter) by using old ammunition of questionable condition. What do the letters or numbers or designs marked on the back of the ammunition mean? These called "headstamps" and usually identify the maker, caliber, or similar information. Sometimes there are small markings on the primer or bullet as well. Colored paint around the primer, on the tip of the bullet or at the joint between the bullet and the cartridge case are also used to identify ammunition. Some is worthless, (or almost worthless) and some is very valuable, but most is only worth relatively little. Just as with some stuffed animal toys, certain people will pay hundreds of dollars for certain cartridges, while other people would not want them at any price. "Old" ammunition generally has very low values (probably less than a dollar, and often only a few pennies per cartridge). This is stuff that shooters are reluctant to use, but not yet desired by collectors. "Collectors' cartridges" are probably 50 years or older, and have some feature that appeals to collectors. Values will generally be in the dollar or less range, but quite a few will bring higher prices with values in the $10.00-20.00 range not unusual, and some bringing much more. Grungy, corroded, dented cartridges have the very least value (if any), while bright examples in a sealed box have the highest value. The only sure way to find the value of anything is for a willing buyer and a willing seller to make a deal. Should I clean or polish ammunition before selling it to a collector? NO, NO , NO!!!! Watch the "Antiques Roadshow" and see what happens to the value of ANY collector item when improperly cleaned. Recommendations for cleaning and care are in our "Guide to Ammunition Collecting"
NO, NO , NO!!! It is illegal to mail ammunition with a live primer or powder charge in the U.S. mail. You must send it by another means, such as UPS (ground service only). Consult your local UPS office for proper procedures. Where can I learn more about ammunition and ammunition collecting? Join the International Ammunition Association. Click here for membership application. Consult our bibliography page for an extensive bibliography of cartridge related books.